You might think Disney invented immersive amusement park rides, but he was a latecomer to the game. As trolley car services grew in cities, they looked for ways to expand ridership. One popular solution: buy land towards the end of the line, and build an amusement park. 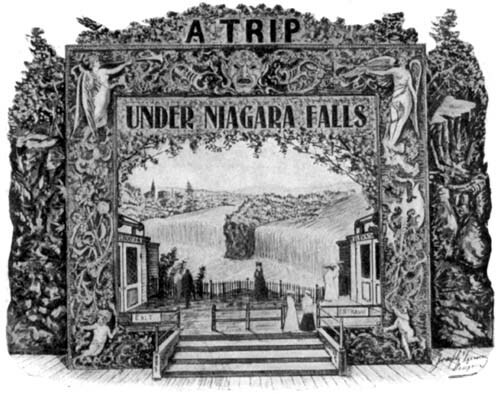 You can't count on short-line railroad entrepeneurs to also be experts in weekend frivolities, so they had to get their attractions from somebody, and possibly a creative genius like Joseph Turner. 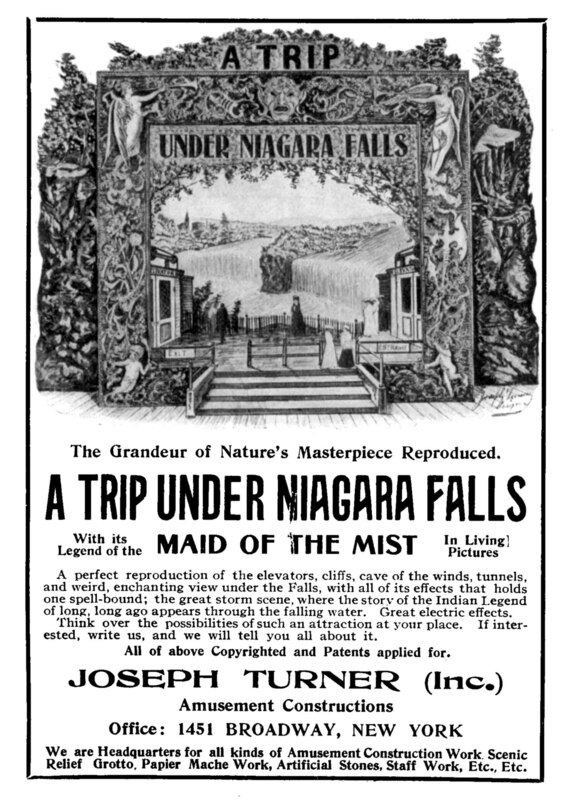 Turner operated his New York business on the premise that the people of Kansas City would love the chance to visit Niagara Falls, complete with synthetic wind, water, and Native American legends. Read the entire ad here. 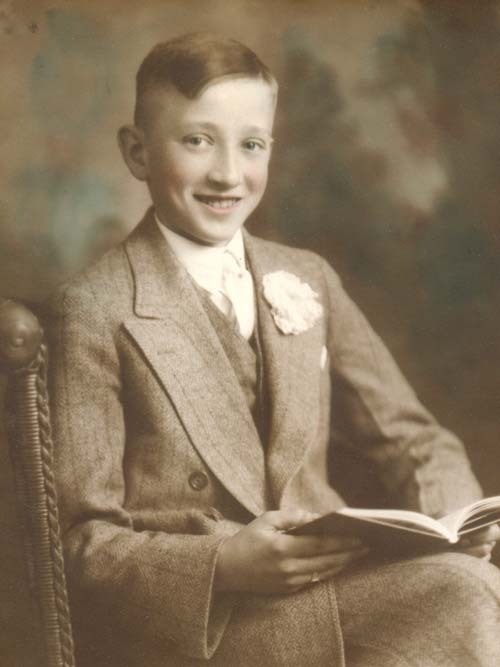 Seated Boy, Book in Lap, 1900s. A hand-colored portrait of a seated boy, holding a book in his lap. Appears 1900s. Man In Driving Gear, 1900s. 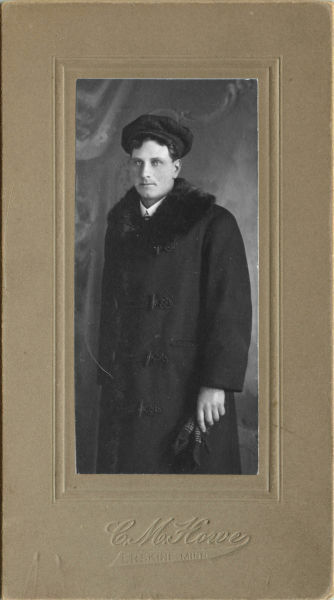 Man in fur-collared, double-breasted driving coat, driving cap, with a pair of gloves in his hands. 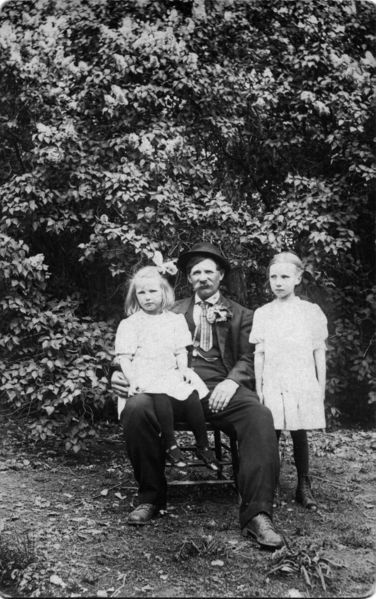 Appears 1900s. Photo by C.M. Howe, Erskine, MN. 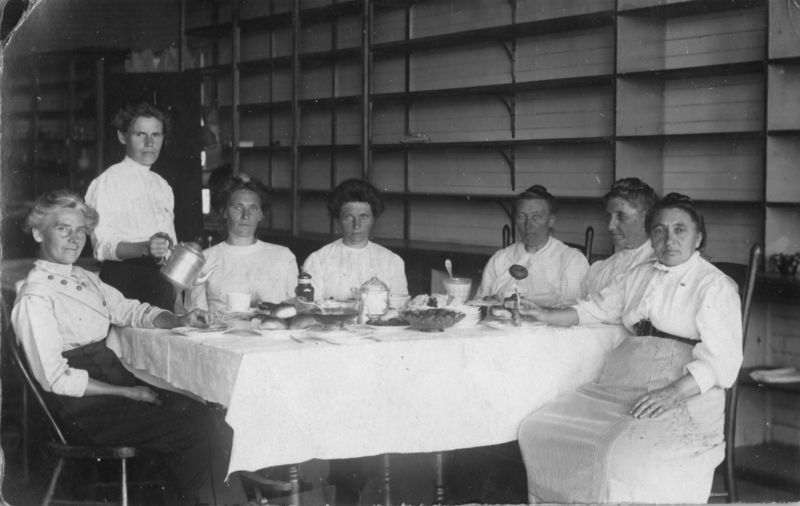 A posed photo of seven women enjoying tea. Note the old woman at the right, holding up a fork with a doughnut impaled on the tines. 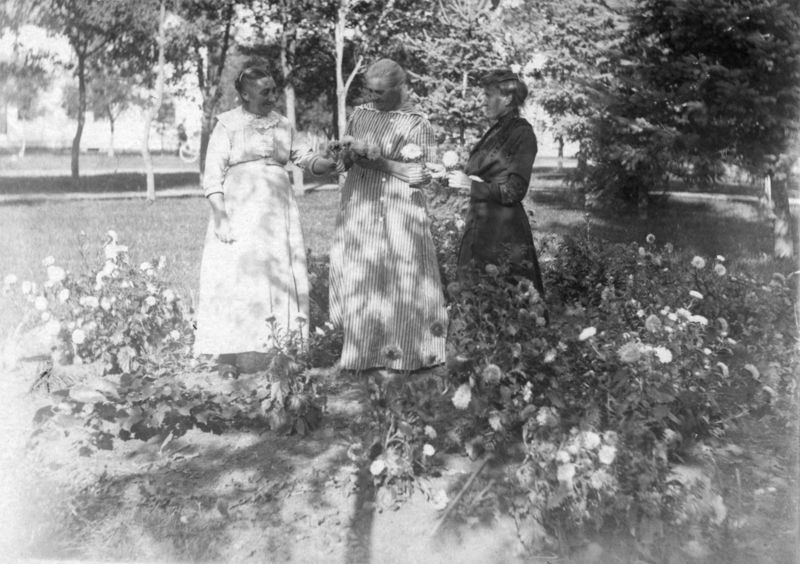 Photo postcard, 1900s. 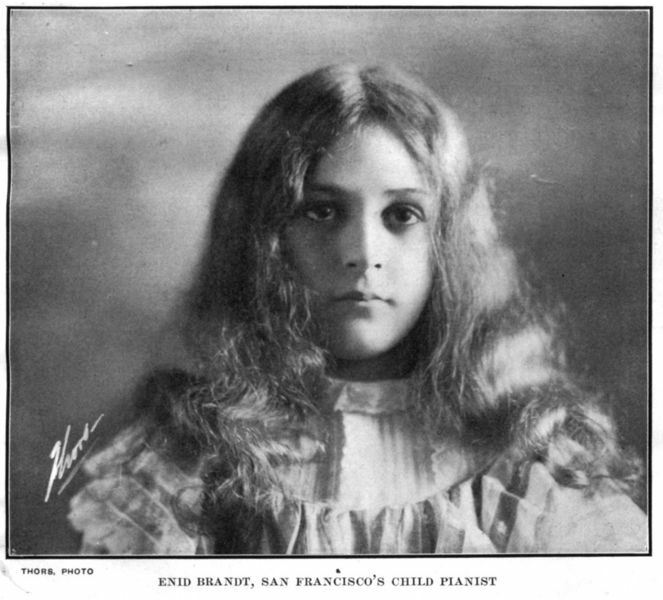 From a real-photo postcard, early 1900s. The reverse had a message written in Norwegian, but had never been mailed. A gentleman, presumably the father, sitting with two girls in front of a large lilac bush. From a real-photo postcard, 1900s. On April 1 1905, railwaymen around the world were pleased to find this issue of Street Railway Journal waiting for them. The magazine contains news and photos regarding municipal electric railways, such as trolleycars -- none of that high-falootin' long-distance steam railroading here! Industry magazines have been a moneymaker for quite some time; their market is niche, they can quickly provide demographics for advertisers, and since they're quite often free, they're guaranteed to get into the hands of the people advertisers want to see it. You can get free industry magazines, too: I get emailed offers all the time, because I signed up for one, and now they've got me. Stuff on chemical processing, digital-optical equipment, modern quality control processes, and internet technology. Those are today's hot, up-and-coming technologies: in 1905, the world of short-line railroads was The Future. 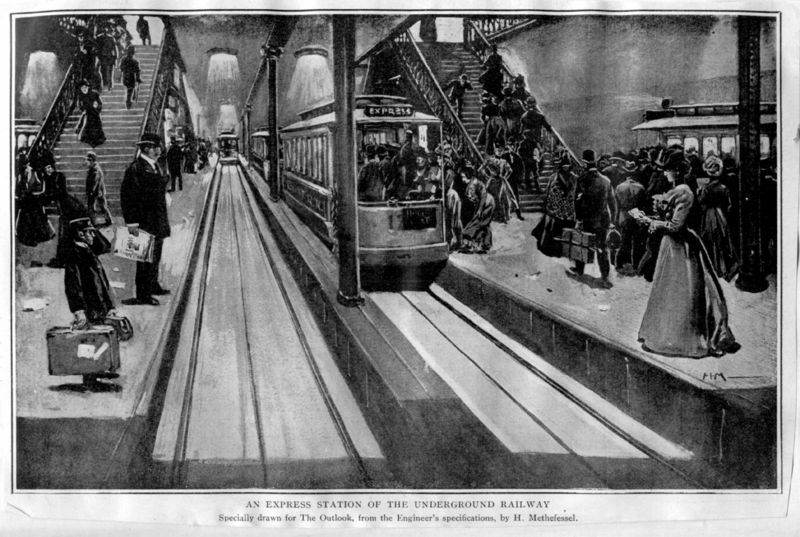 You may not realize it, but the industry is still around: subways, the El, metro light transit, they're all evolved from the electric urban trolleycars of 1905. 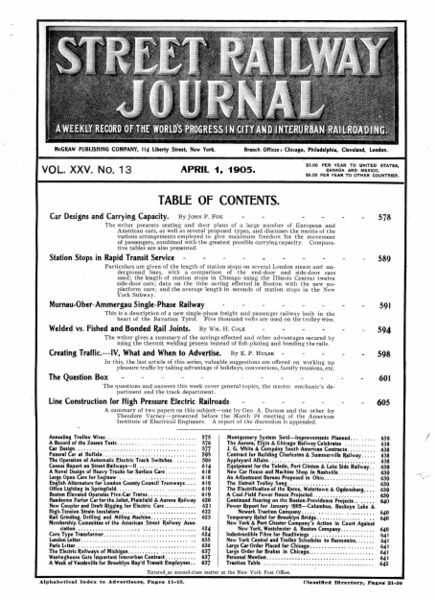 Following the progression of technology, the Street Railway Journal joined with the Electric Railway Review to become the Electric Railway Journal in 1908, and then the Transit Journal in 1932. Where's the rest of the magazine? I'm in the process of scanning it; it'll be available here, and via LuLu like the Fallout Shelter booklet. The most interesting feature of the town of Monterey, for the tourist, is the Hotel del Monte, erected by the capitalists of the Southern Pacific Railroad Company for the accommodation of visitors. It is one of the most complete buildings on the continent for the accommodation of pleasure-seekers. The length is 385 feet, the width, 115; the height, 3 stories. There are accommodations for 400 guests. The hotel has its own gas works, and is supplied with water from its own artesian well. The grounds of the hotel have an area of 100 acres, partly in beautiful garden and lawn, and the remainder wooded with oak, pine, and cypress trees. Neat by, and under the same ownership, are 7,000 acres of land, through which there are fine roads, open to the patrons of the hotel. A bathing pavilion contains four tanks, each 50 feet long and 36 wide. These are fulled with salt water which is heated to a temperature of about 70°. There are also separate bathrooms. The whole establishment is managed in the best style, and it has done much to attract great numbers of visitors to Monterey. The hotel is within a few yards of the beach, so that those who prefer to bathe in the ocean need not tire themselves by walking to reach it. The building seen above, however, was a reconstruction of the original Del Monte, which burned to the ground in 1887. The investors of the Southern Pacific Railroad spared little expense to develop the finest resort hotel in California, away from the larger cities, bordering both the forest and the ocean. The hotel expanded with new amenities like those seen above over time, and eventually passed into the ownership of Samuel F.B. Morse. Morse, already owner of Pebble Beach Golf Course, now also controlled the Del Monte golf course, the oldest golf course in the West. This also put Morse in the position of rebuilding the hotel yet again when the building pictured above burned in 1924. 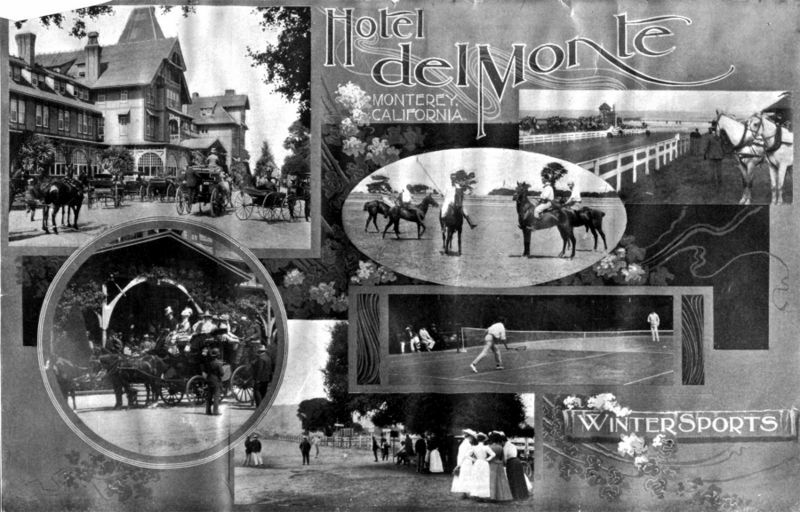 Could you stay at the Hotel del Monte today? You can't exactly go as a visitor, but you can walk the halls SFB Morse built if you were a Navy officer. In 1943, the wartime flight training school leased the hotel and turning it into an educational home; the Naval Postgraduate School was moved there in 1951, occupying all 627 remaining acres of former tourist grandeur. Last week's postcard got a lot of attention thanks to SPS (nsfw), so here's card #2. This appears to hail from the same time-period, but isn't postmarked or dated like the previous card. The top line says, "Quotation From Scripture", and the bottom reads, "So fear those who slaughter the body and the soul." 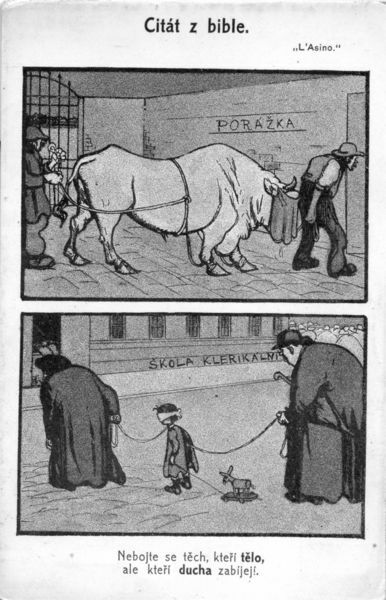 Like a bull to slaughterhouse (porážka), a child is taken in for religious education (škola klerikálni). The blindfold on the bull is used to keep it calm when leading it to slaughter; the child is also being taken 'blindfold to the abattoir,' oblivious to the harm approaching. 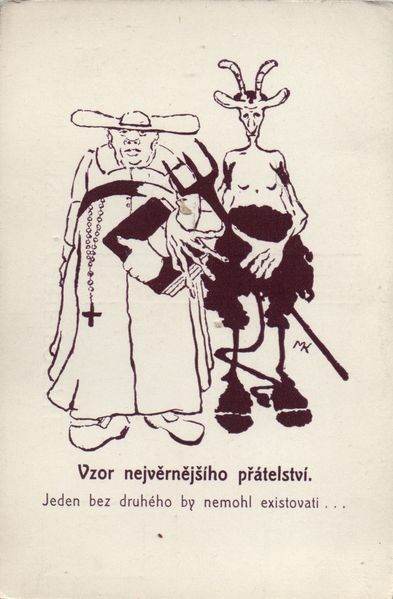 Even without understanding Czech, the image is powerful without the direct accusation of destroying body and soul. The quote isn't right, though; I compared to several Czech translations available online, and the quote is similar to Matthew 10:28, which says not to fear enemies who can destroy the body, instead fear what God can do to your soul in Hell. By changing word-placement, the maker of this card accuses the clergy of making a Hell on earth for students left in their care. I've read up a bit more on what group would be so critical of the church to produce these editorial cartoons so publicly. At the time, turn-of-the-20th-century, the Freethinkers were a prominent group in Czech life, growing from Bohemia and anti-Hapsburg sentiment. The Czech regions, ruled by Austria, were made Catholic states, and popular sentiment began to turn anti-church by the mid-19th century. The Hapsburgs rule ended, and the regions gained more autonomy through the end of the 19th century. Marxism and socialism were developing as social, non-governmental movements, the Freethought movement was very popular amongst the religion-suspicious populous. 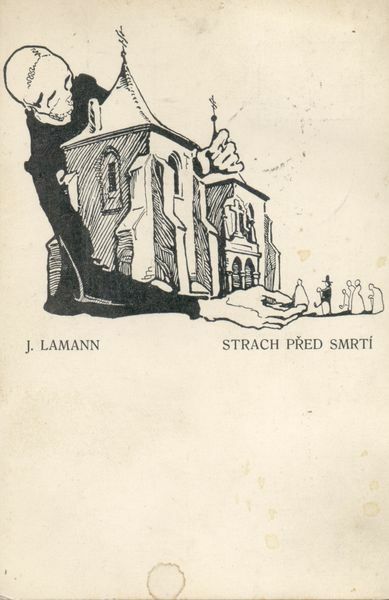 These postcards were popular-sentiment status quo for the young independent, Bohemian Czech Republic. I'm not sure how these children relate to the grumps in this photo from last week, But they seem to share a venue and photographer. It's the same (or very similar) venue, a folded sheet of some sort hung as a backdrop, with a dirt floor. The kids' footing is improved by adding a reed mat on the ground for this photo, but it didn't improve the children's attitudes. Little Gunther looks like he's about to cry, and the photographer is lucky Marta can't actually start fires with her mind even though she's trying really, really hard. 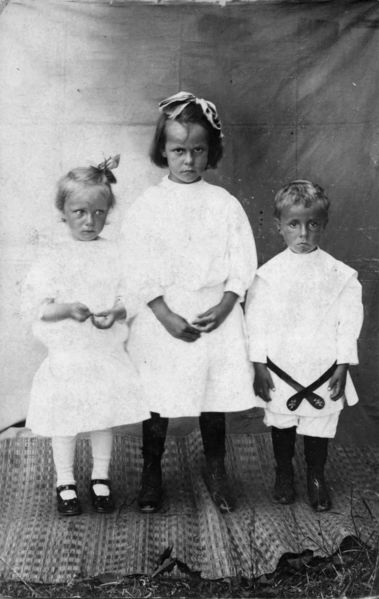 The style of dress is of a similar period as the previous photo, but a bit more formal: all white may signify some religious event is taking place (baptism, first communion, etc. ), or it could be that their church-clothes are the nicest outfits they have to put on for a photographer. I bought a couple of these interesting postcards at a antique show recently. The drawings caught my eye, but the messages on them are a bit more striking as I've been figuring out what they say. They date from the very early 20th century -- this one from 1909 -- and they are all blatantly anti-religious, focusing on Christianity. This one doesn't directly target the church itself, but the followers. The phrase "strach před smrtî", as closely as I can translate, means "The fear of death." To believe in something solely over fear of your eternal soul, the producer of this card believes, is a poor choice for faith. I'm still researching the postcards' origins: they seem too early to be Communist, but religious opposition had many sources in that period. I should know a little more as I get to the other cards in the future. 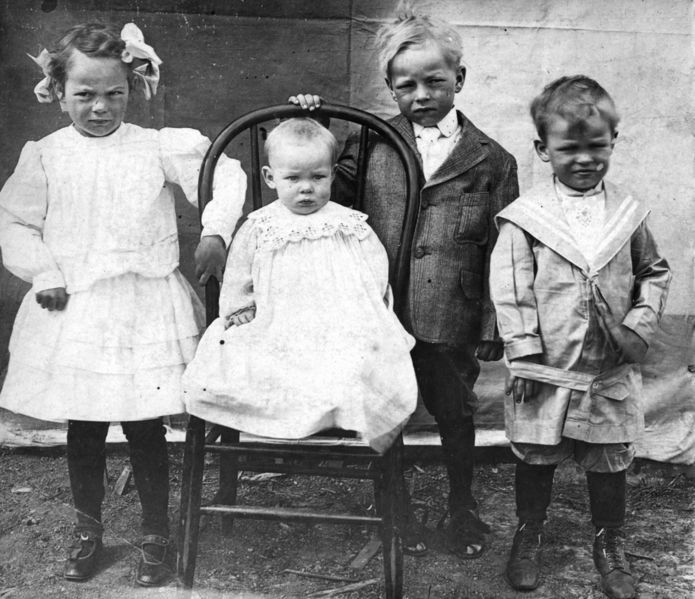 Oh, my -- I know kids hate to get dressed up, but the dress clothes of today pale in comparison to the kids of the early 1900s. That sailor suit on the right? It would cause a riot among modern kids. The photo appears to me to be from a travelling photographer; the ground is dirt and grass, the chair is simple (probably recruited from the nearest building), and the backdrop is simple. Despite the outdoors, the camera is of a vintage without a speedy shutter, resulting in some blurriness. It could, however, also be an attempt to emulate a more expensive photo studio by hanging a sheet over the washline and getting the kids dressed up to the tees. Either way, the kids weren't happy about it.